Using a rotisserie is cool. What in the heck could be better than spinning hunks of meat over a fire? This guide will take you through the basics of selecting and using a Weber rotisserie. 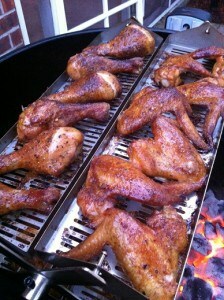 You can do a heck of a lot more with a Weber rotisserie than spin a few chickens! 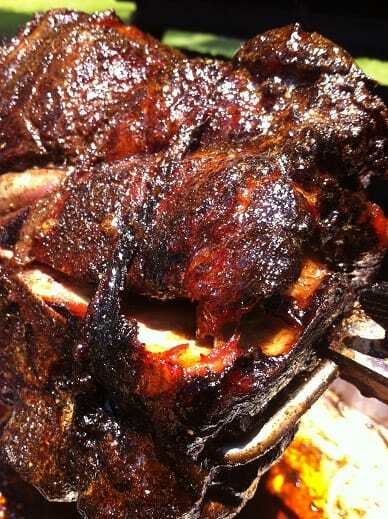 Ever thought about doing pulled pork, spare ribs, pork loins or a tri-tip on a rotisserie? It’s extremely easy and a lot of fun! 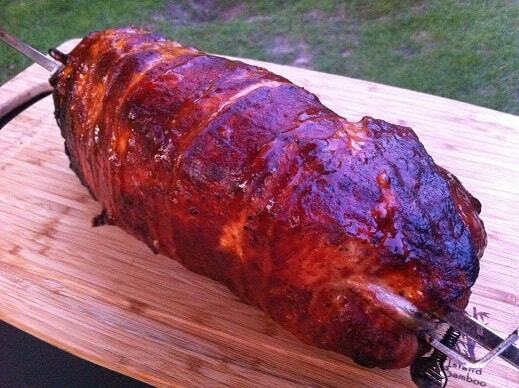 For a page full of awesome ideas to put your rotisserie to use, click here! And hey, if spinning chickens is all you want to do that’s okay 🙂 For a post showing how I spin birds on my Genesis, click here. You wouldn’t think that buying a rotisserie for your Weber grill would be complicated. There have been a lot of changes to the Weber gas grills over the years so the rotisserie assemblies are not interchangeable. Click here to find out which rotisserie fits your Weber gas grill. Things are getting interesting in the field of rotisseries for Weber kettles. Many years ago the only Weber kettle rotisserie you could buy was a Weber product for their 22.5 inch grills. The rotisserie was a poor fit but was functional. Cajun Bandit started selling a stainless steel rotisserie for the Weber 22.5 inch kettles that was very nice. In response, Weber redesigned their kettle rotisserie and it is a much better product than before. Even more recently a company called OneGrill has come in with some very budget friendly options for 22.5 and 18.5 inch kettles. Here is an article that will help you find the best Weber kettle rotisserie for your needs. After you get a rotisserie for your Weber then you might want to consider investing in a Rib-O-Lator. These things are simple, goofy grilling fun that can be the centerpiece of a backyard bbq party. All silliness aside, they are an AWESOME way of cooking large quantities of ribs. Sadly, the Rib-O-Lator is too large to work with the rotisserie for the 18.5 inch kettles. Using a rotisserie is not rocket science but it can be a little intimidating at first. Here are some tips to get you started. Having the meat secured tightly onto the rotisserie spit is one of the most important things you need to do. If the meat isn’t tight it will wobble and flop around. This is bad because the meat will cook unevenly and it places extra stress on the rotisserie motor. Jam those rotisserie forks deep into the meat and tighten down on the thumbscrews. This part isn’t hard so there is no reason to screw it up. This isn’t a “Must Do” but it never hurts and quite often helps. Trussing the meat serves three purposes. (1) It makes sure the meat is secure on the spit; important if you are roasting a pork loin that is smaller than your forks. (2) It helps the meat hold its shape which helps with even cooking. (3) It looks cool as heck. After you get the meat secured and trussed take the rotisserie spit out to the grill and give it a quick spin while the grill is still cold. Most of the time everything will look great but every now and then you will spot a problem. You might find that the meat is wobbling; you need to remove the grill grate on your gasser or maybe even the Flavorizer bars. If you are using the Cajun Bandit this is a great time to see if the batteries still have some life. Anything you find will be much easier to correct while the grill is cold than when it is hot. Throw a disposable aluminum pan under whatever is spinning on your rotisserie. This will help keep your grill clean and if you are so inclined you can collect the drippings from gravy. Some folks add aromatics (onions, carrots, celery) to the pan while others recommend adding some water to the pan to keep the drippings from scorching. I don’t add anything to my drip pan but that’s just because I am lazy. When I first started using the rotisserie I had the meat directly over the charcoal. Turns out this is a great way to burn the heck out of the meat as the grease catches on fire. If you are using a kettle rotisserie bank the coals to the side. If you are using a gas grill then use the outer burners. Treat using a rotisserie just like any other indirect grilling technique. It should take just as long to cook something on a rotisserie as it takes when indirectly grilling. The cook times should be completely transferrable. In reality rotisserie cooking takes quite a bit longer. The main reason it takes longer for me is that I keep opening the grill to watch the meat spin. I love watching spinning roasting meat and if peeking every now and then slows the cook down then so be it. The rotisserie will be HOT when it’s time to tacit it off the grill. The kettle rotisserie and the older gas rotisseries have wooden handles so it is possible to take the rotisserie off the grill without gloves. Still, there are times when you will need to grab the other end of the hot spit and you are going to want some gloves. The newer gas rotisseries have metal handles so you absolutely need to have gloves to get the spit off the grill. This is grilling 101 and doesn’t change just because you are using a rotisserie. Use a digital thermometer to know when the meat is done; don’t guess. Even if you are an experienced griller using a rotisserie will take you out of your routine and your “internal calibrations” for time and temperature can be thrown off. Don’t worry too much about the counter balance; the newer gas rotisseries don’t even have one. The counter balance makes life easier on the motor when the meat is unbalanced on the spit. I have roasted a nine pound pork shoulder that was extremely unbalanced and the motor kept up just fine without the counter balance. If you have one it doesn’t hurt to use it but if you are getting frustrated with the thing just chill because you don’t really need it. Using a rotisserie is great grilling entertainment! Don’t be intimidated by rotisserie grilling. Go throw some meat on the spit and let that bad boy turn. As long as you the meat is tightly secured to the spit, you are using indirect heat and an instant read thermometer you are not going to mess up. Invite some buddies over; open up the grill and let them watch the beauty of roasting, spinning meat.